The past 20 years have seen an explosion in the development of information technology, to the point where people now spend a lot of their time in a space – ‘cyberspace’ – which did not exist previously (Barak & Suler, 2008). While there are substantial benefits associated with technology, it can also be problematic. What happens in the cyber world can impact on the real world, and vice versa. As a Cyberpsychologist I find the idea of this continuous interaction between cyber and real world fascinating, particularly in the context of criminality. My research to date has focused mainly on Forensic Cyberpsychology, aspects of criminal behaviour manifested in a virtual context, and I am currently the Director of the RCSI CyberPsychology Research Centre and Academic Advisor (Psychology) to the European Cyber Crime Centre (EC3) at Europol. My current research interests range from ‘Pathways into Organised Cyber Crime’ with Europol, to technology solutions to ‘Technology Facilitated Human Trafficking’ with the White House. In fact it was the latter project that first brought my work to the attention of the entertainment industry. It all happened quite quickly. I was invited to meet CBS network executives in Los Angeles, a 15-minute interview turned into a two-hour discussion, and this was followed by an invitation to become a producer on a new show. And so, the US television show CSI:Cyber was conceptualised, inspired by my work as a Cyberpsychologist. My character, FBI Cyber Crime Special Agent Avery Ryan, is played by the Oscar winning actress Patricia Arquette. The series is now airing on Channel 5 in the UK. To be honest I try not to dwell on the Hollywood part too much, the responsibilities and processes associated with the production of a major network show, as it is all just a little surreal – for an academic. That said, being part of a talented creative team, bringing cutting edge cyber crime stories to life, reaching a worldwide audience, and building on the incredible legacy of the CSI franchise is both exciting and rewarding. First and foremost I am an academic, an educator who cares deeply about the impact of emerging technologies on all of us. Sometimes I cannot help but think that we are sleepwalking our way into an age of technology – as we adopt each new technological evolution with the collective wisdom of lemmings leaping off a cliff. Let’s press pause for just a minute and consider - Where is the societal debate? What is the role of governance or cyber ethics? Technology was designed to be rewarding engaging and seductive for general population – did anybody really think about the impact on criminal, deviant or vulnerable populations? 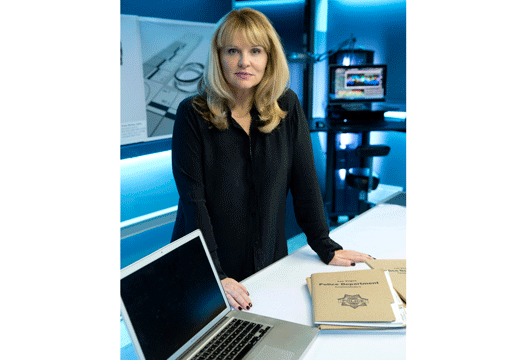 I am really pleased that my involvement with CSI;Cyber has meant that my discipline of Cyberpsychology has been introduced to a worldwide audience; in fact the pilot of our show broke a Guinness World Record in March 2015 when it was broadcast in 171 countries simultaneously. (Apologies to Doctor Who fans, as the world record had previously been held by that show, broadcast in 98 countries in 2013). As a discipline, Cyberpsychology is concerned with the impact of emerging technologies on human behaviour, delivering insight, as law enforcement say, where humans and technology collide. Although Cyberpsychology focuses on Internet psychology, it also incorporates other technologies: virtual environments, artificial intelligence, gaming, digital convergence, social media, mobile technologies and networking devices. The field has rapidly evolved from an emerging to an established field within applied psychology. There are 30 peer-reviewed journals publishing in this area, and over 1000 articles now being generated per annum. It is predicted that as a discipline cyberpsychology will enjoy exponential growth due to the continued rapid acceleration of Internet technologies, and the unprecedentedly pervasive and profound influence of the Internet on human beings (Yan, 2012). The scientific study of cyberspace began in the early 1990s when researchers first attempted to analyse and predict human behaviour mediated by technology. Arguably, with rapid development of technology many new types of cyber behaviour will emerge in the future, and this is particularly true in terms of criminal behaviour. It is something we explore in almost every episode of CSI:Cyber, from the hacking of babycams whereby cyber criminals auction infants online and then kidnap to order, to ‘Pyromania 2.0’ – an episode about a so-called ‘zero day exploit’ that made printers catch fire. Whilst the Internet offers many opportunities for education, networking and communication as an information superhighway, it can also manifest risk, particularly regarding vulnerable populations such as children. It is estimated that the ‘surface web’ accounts for only about 1 per cent of all content online; the remaining 99 per cent is housed in the ‘Deep Web’. During one of my first meetings with the CSI:Cyber team I drew an iceberg on a whiteboard to explain the size and scale of ‘what lies beneath’. A version of my iceberg sketch was actually featured in an episode of CSI:Cyber. In another episode we used graphics to explain a step-by-step spatial and temporal analysis approach to Geographic Profiling: a 40-second clip from the episode dubbed ‘CSI: Cyber, Evolutionary Instinct’ generated over a quarter of a million views on YouTube. Essentially, the mapping and visualisation of complex abstract constructs is key in terms of how theories and practice can be translated into popular culture. Overall my experience has been a very positive one, yes of course some will criticise, but generally the response has been very positive. In fact the academics at the West Point Army Cyber Institute wrote a great piece in the Cyber Defence Review titled ‘Why CSI:Cyber Matters’ which pointed out that ‘Done correctly, shows like CSI: Cyber can both educate the populace and inspire the next generation of information security professionals’. From my perspective the show provides an incredible opportunity to inform and to educate regarding cyber safety and security issues, to reach out and to raise awareness, and to do so in an engaging and entertaining manner. As they say in Hollywood, it’s ‘edutainment’. In a more general context my great friend and colleague, the founder of the discipline of Cyberpsychology Professor John Suler, points out that researchers from all branches of psychology are increasingly expressing an interest in cyberspace, including cognitive, social, educational, organisational, personality, clinical and experimental psychologists. However, as psychology delves deeper into cyberspace we need to question if traditional psychological concepts are sufficient in understanding online behaviour. Will we need to develop new theories, or modify existing ones? Interestingly, a television show provides an excellent platform to demonstrate new constructs. We understand the premise of real world staging of a crime scene, and now in a number of CSI:Cyber episodes we have shown how virtual crime scenes can also be staged and manipulated. Many are familiar with the so-called ‘CSI Effect’, defined by American criminologist Monica Robbers – perhaps we should now consider the ‘CSI Cyber Effect’. Unfortunately there exists what can only be described as an academic ‘land grab’ in cyberspace: everyone from Computer Scientists to Economists are claiming ownership of this new domain. I firmly believe we need to broaden scientific investigation and adopt an inclusive transdisciplinary approach to this exciting, fascinating and incredibly important new research frontier. The power of television and online media can certainly help in that process. - Professor Mary Aiken is the Director of the RCSI CyberPsychology Research Centre and Academic Advisor (Psychology) to the European Cyber Crime Centre (EC3) at Europol. Barak, A. & Suler, J. (2008). 'Reflections on the Psychology and Social Science of Cyberspace.' In Barak, A. (ed.) Psychological Aspects of Cyberspace: Theory, Research, Applications. Cambridge: Cambridge University Press, pp. 1-12. Yan, Z. (ed.) (2012). Encyclopedia of Cyber Behavior. Hershey, PA: Information Science Reference.